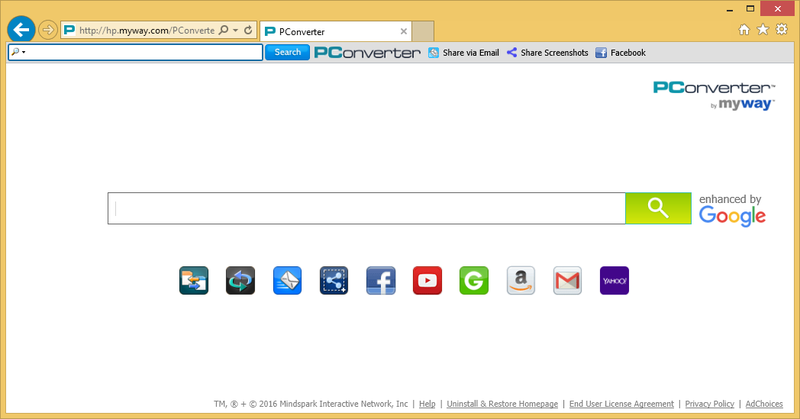 PConverter Toolbar is a browser add-on developed by Mindspark Interactive Network. It is also considered to be a potentially unwanted program (PUP). PConverter Toolbar is advertised as a conversion toolbar and that is certainly a useful feature. However, it makes some unwanted changes to your browser and keeps track of your browsing activities. A PUP is not a malicious computer virus so it will not harm your computer directly. However, it is considered to be a PUP for a reason. PConverter Toolbar might be able to install without your knowledge, via software bundles and then proceed to try to redirect you to sponsored websites. It’s not malicious so there is no urgent need to delete PConverter Toolbar but we suggest you at least consider it. Why should consider PConverter Toolbar removal? A lot of Mindspark Interactive Network products spread via software bundles. Those items are attached to freeware in a way that allows them to install automatically if the user does not deselect them. When users choose Default settings when installing freeware they are making a mistake. Default settings do not show if something is attached to the freeware, and those items will install automatically. If you want to prevent such unwanted installations, you need to start using Advanced (Custom) settings. When the user selects these settings, he/she will be able to view all added items, and if need to be, they can be deselected. PConverter Toolbar can also be installed via the official website and various download pages. Whether you installed it yourself, we suggest you uninstall PConverter Toolbar, or at least consider it. When you install PConverter Toolbar, it will add itself to all of your browsers, not matter if it is Internet Explorer, Google Chrome or Mozilla Firefox. It will alter the browser’s settings and set ask.com as your homepage, new tabs and search engine. These kinds of changes are usually made without the knowledge of the user and cannot be undone, unless the user chooses to delete PConverter Toolbar from the computer. PConverter Toolbar is not malicious so do not expect it to cause havoc on your computer. However, be aware that it will monitor your browsing sessions and gather certain information about you, the non-sensitive kind. If you use the search engine, you might find that there is a lot of sponsored content mixed into the results. If you find the above described behavior irritating, you should remove PConverter Toolbar. If you start wondering how to remove PConverter Toolbar, we can help you. You should be able to eliminate. PConverter Toolbar by hand without much difficulty. However, some users struggle with finding its location so they can manually uninstall PConverter Toolbar. If you do not feel confident about it, you can use a powerful removal tool. It should be able to erase PConverter Toolbar quickly.